We are fast approaching the 2018 Primary Election where you’ll have a chance to vote for the candidates that will ultimately represent your party on the General Election ballot. 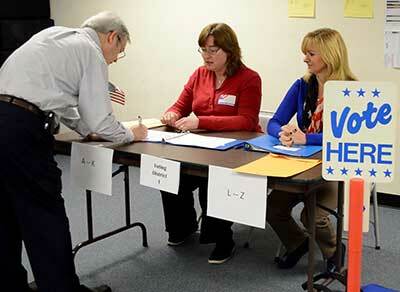 This year Sussex County voters will head to the polls to elect a U.S. Senator, U.S. Congressman, as well as your County Surrogate, two County Freeholders, and several municipal-level representatives. Mark the calendar. Tuesday, June 5th is Election Day. Polls open throughout the county from 6 a.m. to 8 p.m.
Register to vote. If you’re not already a registered voter, download a voter registration form and begin the process. New Jersey law requires that voters be registered with their county a minimum of 21 days prior to Election Day. If you’re not sure of your voter registration status, click this link. Remember that in the Primary your party affiliation status does matter; you must vote in the primary of the party to which you are affiliated. If you want to change parties, you must do so at least 55 days prior to the primary election. You can use a Voter Registration form to change parties, or complete a new Party Affiliation form. Voter registration forms and/or party affiliation forms should be mailed or dropped off at the County Election Board, 83 Spring St., Suite 305, Newton, NJ 07860. If your current registration status is “unaffiliated” you may choose to vote in either the Democratic Primary or the Republican Primary on Election Day. When you arrive at your polling place, just ask the poll worker to give you the ballot of your choice. You should note that by voting in that party’s primary, you become affiliated with that party (although you can always choose to “unaffiliate” yourself again in the future by submitting a change request). Research candidates. Learn about the issues and how the candidates feel about them. Tune into debates, town halls, and speeches. Make a plan. It may sound obvious, but having a voting plan is one of the most important things you can do after registering. Work, school, picking up the kids and grocery shopping can make any day hectic. Making a plan to get to your polling station is key. If you are housebound and know you won’t be able to get to the polls on Election Day, you can plan to vote by mail ahead of time. Active military members can also vote absentee and make their voices heard at the polls. Plan ahead and make sure you get your vote in on time. Spread the word. Friends, family and acquaintances often talk politics, but sometimes don’t make it to the ballot box. Find out if those around you are as prepared as you. If not, educate them. If they haven’t registered, direct them to their county board of elections to register. Be the informed one in your group. You must provide a copy of Form DD-214, Certificate of Release or Discharge from Active Duty, with your return the first time you claim the exemption(s). You must provide a copy of your Certificate of Release or Discharge from Active Duty, DD-214, the first time you claim the exemption. We can only accept the member 4 copy of DD-214. This form does not need to be provided each year. The United States National Archives and Records Administration can assist with obtaining a copy of your DD-214. Note: We can only accept the member 4 copy of DD-214. More information from New Jersey Division of Taxation. Monday, December 18, 2017 10-11:30 a.m.
Come and share your thoughts and ideas during this open dialogue session! The Kosa Veteran Support Center, Inc. The Kosa Veterans Support Center is currently open on Wednesdays and Fridays from 10 a.m. to 2 p.m.
Do you have a heart for helping your fellow veterans? Can you paint? Are you able to do handyman work? We are looking for volunteers to man the Center, help other veterans who may need assistance with their living quarters as well as provide other various supports and/or resources. Any assistance you can provide would be greatly appreciated! We are excited to be able to help our fellow veterans in need, but we can’t do it without you!